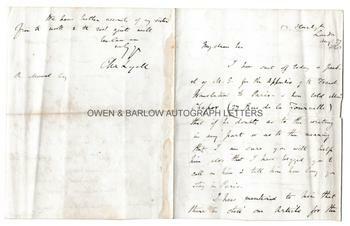 CHARLES LYELL autograph letter Signed. British geologist. Considered to be the founder of modern geology. ALS. 4pp. 53 Harley Street, London. August 27th 1863. To R. Monat, Esq. 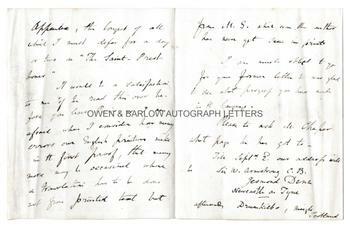 "I have sent off today a packet of MS for the appendix of the French translation to Paris and have told Msr. Chaper (27 Rue de la Tournelle) that if he doubts as to the writing in any part or as to the meaning that I am sure you will help him, also that I have begged you to call on him and tell him how long you stay in Paris. I have mentioned to him that there is still an article for the Appendix, the longest of all which I must defer for a day or two on "The Saint-Prest bones". It would be a satisfaction to me if he read this over before you leave Paris as I am afraid when I consider how many errors our English printers make in the first proof, that many more may be occasioned when a translation has to be done not from printed text but from M.S which even the author has not yet seen in print. 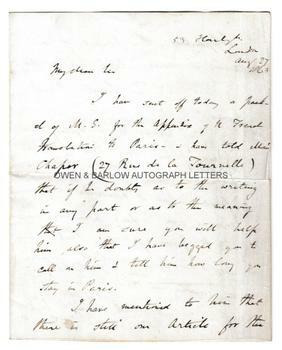 I am much obliged to you for your former letter. I was glad to see what progress you had made in the language. Please to ask M. Chaper what page he has got to. Till Septr 2nd our address will be Sir W. Armstrong C.B., Jesmond Dene, Newcastle on Tyne, afterwards Drumkilbo, Meigle, Scotland. We have better account of my sister from the north and the girl quite well. Believe me, sincerely yours, Cha. Lyell." 12mo. Approx 5.25 x 4.25 inches (13 x 10.5 cms). Old folds, creasing to right edge. Slight mounting traces to right margin of verso of last leaf. All else near fine. Charles Lyell is almost certainly referring to his work 'The Geological Evidences of the Antiquity of Man', which was published in London later in 1863 and which appeared in France in Chaper's translation in 1864. This was a seminal work in which Charles Lyell propounded his theories on how long man had existed on Earth, the geological evidence for the previous existence of "ice-ages" and his commentary on the theory of evolution of Charles Darwin, in which he modified how own long-held views on this. Charles Lyell was the first to publish such a book on prehistoric man and his book was the precursor to Darwin's 'Descent of Man'. The St. Prest fossil bones had been discovered in 1863 by Jules Desnoyers. Charles Lyell had believed that marks on the bones had been made by rodents but de Mortillet suggested that marks had been made by stones moved by geological pressure. The Appendix which Charles Lyell refers to was one of the first commentaries on the bones.